After a long, doctor-ordered break, Combination Play is back - and with a report on Chelsea vs. Liverpool, no less. Last Saturday, the two teams played the first of two matches between them in four days' time. This time, Chelsea got the better of Liverpool, but barely. Roberto Di Matteo's men started off brimming with confidence, surely a direct result of their last feats. 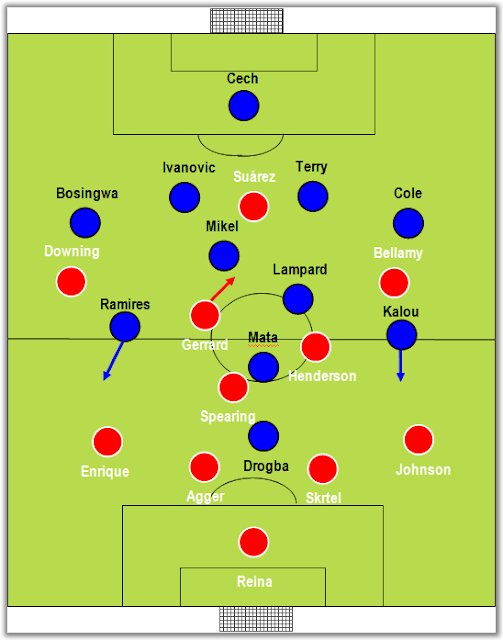 With Di Matteo's favourite eleven for the most challenging games, Chelsea were cohesive, intense (both offensively and defensively) and willing to attack. On the other hand, the team coached by Kenny Dalglish were clearly waiting for what the contest might bring and chose to sit back. 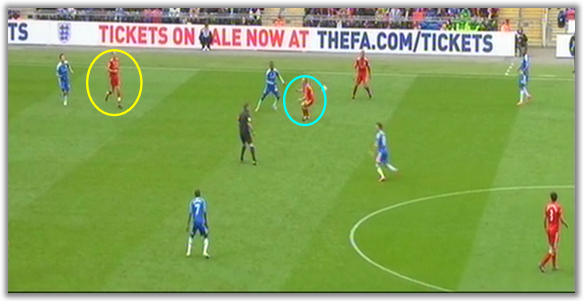 With Gerrard and Mata instructed to play close to their midfield, the middle of the park was packed, as expected. 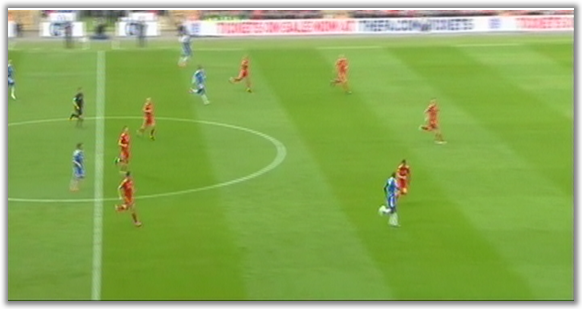 However, Chelsea's goal ten minutes into the game shook things up and served as proof of the Blues' attacking intent. The play that led to the first goal was also useful to assess the importance of offensive and defensive coverage, as well as Luis Enrique's approach when facing Ramires. The importance of offensive coverage cannot be overstated. Spearing (blue) has just misplaced a pass. Henderson is higher up the field and Gerrard is nowhere to be seen. toward his area. Mata has all the time in the world to pick his pass. instead of trying to delay Ramires and wait for backup, which allowed Ramires through. In fact, the Liverpool midfield was one of their bigger problems. With Gerrard close to Suárez and Henderson straying up field, Spearing was easy prey for Mata, who was thriving in the pockets behind his opponent's midfield and dragging Spearing all over the place. With Chelsea faithful to their now usual 4x4x1x1, the transitions into attack were directed at Drogba, who was finding it very easy to knock the ball down for the Spaniard wizard to play his team-mates into play. Unlike previous matches, Lampard played higher than Mikel and was allowed to make runs into the box, further worsening the Reds' situation. Liverpool, in turn, were rather slow on the ball and clearly lacked a creative spark. 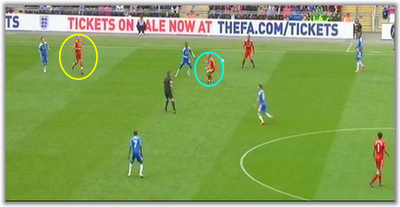 In fact, Gerrard would often drop back to pick up the ball, leaving Suárez even more isolated up front. Given the opponent's lower threat, Ivanovic was happy to meet the Uruguayan high up, keeping Liverpool from getting enough quality time on the ball. 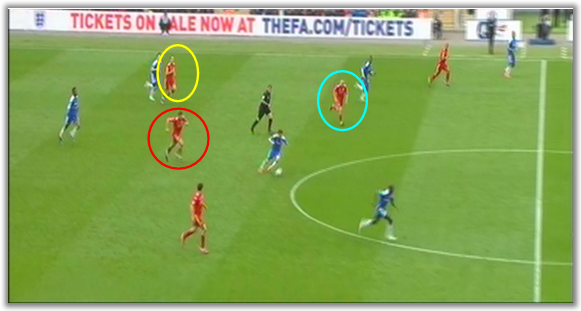 Notice how poorly Liverpool's back four was shielded throughout the match. Dalglish had to change something for the second half and he decided to shift to a more traditional 4x4x2, with Henderson playing as right-midfielder, Gerrard beside Spearing and Bellamy just off Suárez. Somewhat predictably, the Liverpool midfield was constantly overrun, namely for Chelsea's second goal, scored by Drogba. With a little flick, Lampard was able to find himself loads of space to run into and assist Drogba. The match seemed to be pretty much wrapped up, but three minutes later, Dalglish replaced Spearing for Carroll. Henderson went back to his more natural central-midfield role, Bellamy went back to his right-winger spot and Suárez dropped to play off Carroll. As it turned out, Carroll proved a pivotal presence to get Liverpool back into the game. Not only did he take full advantage of a defensive mistake from Chelsea for the first goal, but he also provided an attacking outlet for his team, particularly because both Terry and Ivanovic had a hard time dealing with the Geordie's physique and approach. After clawing their way back into the game, Liverpool kept on piling up the pressure over the Blues', whose coach was a bit late in reacting to his team's obvious increasing fatigue. It was then that Carroll was even more valuable, by not allowing Chelsea's back four any resting time, giving them a taste of their own poison - actually, Carroll was very unfortunate not to see a second goal stand near the end of the match. All in all, the best team won. Liverpool were seldom aggressive, had huge problems getting the ball out from the back, were slow on the ball and weren't exactly ambitious in their approach. On the contrary, Chelsea were always keen on controlling the game and its tempo and, were it not for Carroll's somewhat fortuitous goal, would probably see out the match at ease.